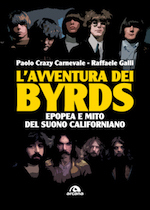 New book about the byrds "L'AWENTURA DEI BYRDS" Order here, or here from Amazon Italy ! Note: Book written in Italian!!!! don't hesitate and send an e-mail to me at thomas.aubrunner@hotmail.com. We remained close friends� until he died. I will always miss him." during the "Nashville West" days in Palmdale California. On stage Clarence was shy, hardly ever spoke and almost never smiled. In reality he was a very funny guy, a real prankster always pulling jokes on someone. very creative, one of a kind guitar player with his own unique style. He lives on in history as one of the greatest. He will always be missed." Clarence was like a security blanket when you were on stage with him. Clarence was solid as a rock when he took off on an intro or solo ride. that you'd never heard before and really fit where you were trying to go. I feel very blessed to have witnessed such a talent in my lifetime." "I think that opening a web site for Clarence is a good idea. I have always appreciated Europeans interest in American music and musicians. Clarence was a close friend and I still miss him after all these years since his death. He was a great innovator of the guitar rhythmically and technically. "It's hard to say something great about Clarence that hasn't been said before. but I remember him more for the great person he was. and never thought twice about helping anyone who was his friend. like some�of his contemporaries did. with much warmth and fondness. He was truly one of a kind." "Clarence was a great musician, singer, and guitar player. For a banjo player, Clarence had a way of making everything I played make sense. for the banjo to be all that it can be. He had an uncanny understanding and intuition for the proper feel of the music. Listen to his accompaniment to "Blackberry Blossom" on the Live in Sweden recording. and propels the music to places it could not have gotten otherwise." - but if anyone could do it, you could. I never had the opportunity to personally meet or get to know Clarence. in creating that�wonderful California Country�Rock sound." on electric guitar, and on acoustic as well. which was sort of a new concept to me. but never as well as the master did. for all the newgrass Tony Rice type players out there now. I miss him a lot." what Earl Scruggs did for the 5-string banjo. but also as a lead instrument"
"Appalachian Swing"�came out in the early 60's. Naturally It changed my life. I was playing bluegrass in my home town on the coast of Georgia, still in high school. for many years, his name is Tut Taylor. He also done a record album�with Clarence and Bill Keith. to jam with the many bluegrass pickers that attended. 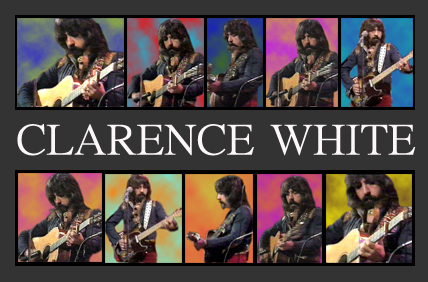 and it was Clarence White! I had jammed with the Clarence White! I was in awe of his playing as well as his humbleness. I don't know who they were. and what he might have been doing there at that time. I would truly love to know who those guys with him were? when we heard that Clarence had been killed, I was devastated and mad. and that filled our lives with so much wonderful music and joy? Even now tears fill my eyes as I type. � I became a Byrds fan back in the 60's only because of Clarence and Chris Hillman. I hope some day to meet Chris and Herb�another one of my heroes. � I thank �you for this web site and the opportunity to share our friend Clarence."